""She Got the Radio" (promo, Canada only)"
"Sunglasses at Night" is a song by Canadian singer Corey Hart. It was released on January 21, 1984 as the first single from his debut album, 1983's First Offense, and became a hit single in the United States, rising to number 7 on the Billboard Hot 100 in August 1984. The song combines an unflagging synthesizer hook, characteristic arpeggio, rock guitar and cryptic lyrics. AllMusic has since described it as "an instant classic with its distinctive melody and catchy chorus". According to co-producer Phil Chapman, the recording sessions for the album took place in a studio whose air conditioning/heating vents were directly above the mixing console. Air from the vents blew directly into the faces of the control room personnel, so they often wore sunglasses to protect their eyes. Hart, working on a new song, began to improvise lyrics that included the line "I wear my sunglasses at night." The song is performed in the key of B♭ minor in common time with a tempo of 127 beats per minute. Hart's vocals span from F4 to A♭5. The music video, directed by Rob Quartly, shot at the Don Jail in Toronto, reflects the vision of a "fashion" police state, with scenes of Hart in a prison cell, without sunglasses, being strong-armed by police officers and paraded past various citizens wearing their regulation shades. Near the end of the video, Hart is taken to the office of a female police officer (who releases Hart in the song's end), played by Laurie Brown, who later became the host of The NewMusic as well as a VJ on MuchMusic. This video uses the shorter single version instead of the longer album version. ^ Simon Cantlon. "First Offense". AllMusic. ^ Hart, Corey. "Corey Hart "Sunglasses At Night" Sheet Music in Bb Minor (transposable)". Musicnotes.com. Retrieved 2017-12-20. ^ "Spot On Track - The Spotify Tracker". www.spotontrack.com. Retrieved 2017-12-20. ^ Ward, Christopher. Is this Live? : Inside the Wild Early Years of MuchMusic. p. 68. ^ Kent, David (1993). Australian Chart Book 1970–1992 (Illustrated ed.). St. Ives, N.S.W. : Australian Chart Book. p. 134. ISBN 0-646-11917-6. N.B. the Kent Report chart was licensed by ARIA between mid 1983 and 19 June 1988. 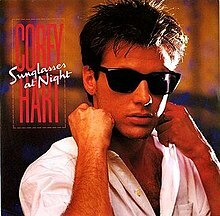 ^ "Offizielle Deutsche Charts > Corey Hart – Sunglasses at Night (single)" (in German). GfK Entertainment. Retrieved 2016-04-12. ^ "Dutchcharts.nl – Corey Hart – Sunglasses at Night" (in Dutch). Single Top 100. ^ "Charts.nz – Corey Hart – Sunglasses at Night". Top 40 Singles. ^ "CASH BOX Top 100 Singles – Week ending September 1, 1984". Archived from the original on 1 October 2012. Retrieved 2018-01-13. CS1 maint: BOT: original-url status unknown (link)Cash Box magazine. ^ "The CASH BOX Year-End Charts: 1984". Archived from the original on September 30, 2012. Retrieved January 1, 2018. ^ "Arsis - Unwelcome (album review )". Sputnikmusic. Retrieved 2013-12-16.